We’re excited to introduce you to the newest member of our Board of Directors, Julie Morgan, who joined the Board in November. We’re recruiting new members right now — you can learn more here. 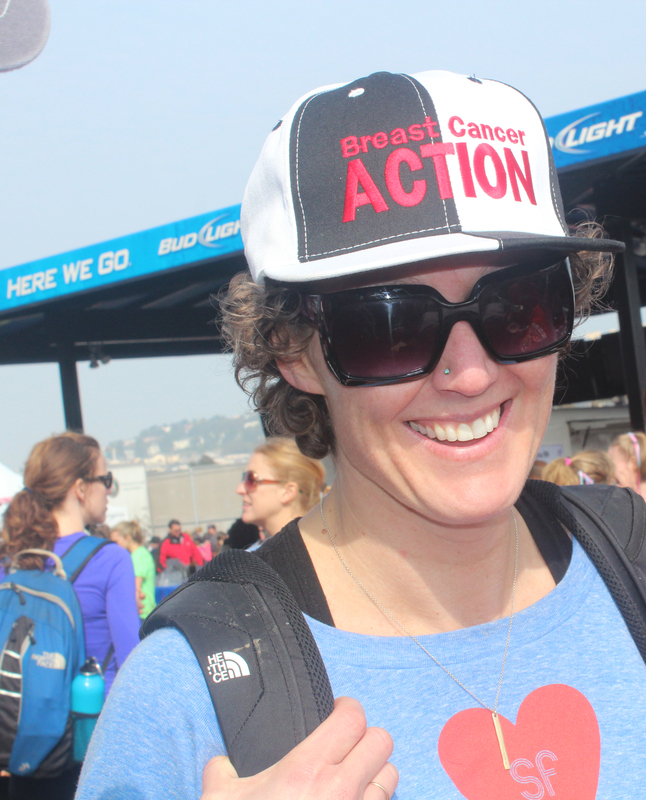 Tell us a little about yourself prior to becoming a new BCAction Board member. I’ve been living in San Francisco for ten years and work as an orthopedic nurse. I’m from Massachusetts originally, and I moved around growing up and continued to move around as a travel nurse – I worked on three month assignments around the country. My favorite places to live after all that traveling: Seattle in the summer and Denver in the winter and San Francisco year-round. I was diagnosed with breast cancer in 2011 at the age of 37. Last year, after attending a screening of Pink Ribbons, Inc. with my breast cancer support group, I learned that Breast Cancer Action was holding a screening of the film and volunteered to help out at the event. BCAction was the first breast cancer organization I got involved with after my diagnosis and treatment. The breast cancer community is full of pink ribbon events and products and I knew I didn’t agree with so much of the pink spin on breast cancer. When I saw the movie, in which BCAction is heavily featured, I saw an organization that was speaking to me and my ideas about the breast cancer movement. I was always very aware that many of the products being sold and promoted in the name of breast cancer had ties to breast cancer itself and I was very turned off by that. I always questioned how much of the profits were actually going to breast cancer research. When you look at the prevalence of pink ribbon nonsense vs. how little headway we’ve made with breast cancer, you know there’s got to be a problem there. Why did you decide to join Breast Cancer Action’s Board of Directors? There are a lot of causes I care about but I’ve never been sure what my role could be. I’ve spent my whole adult career as a nurse on a medical-surgical floor and have done some volunteer work, but didn’t know if I had the skills to get involved on a deeper level. I’d been volunteering in the BCAction office for four months and the BCAction community, including the Board and staff, was very nurturing. Volunteering and now joining the board has been a great opportunity to learn about an organization I care about and contribute to its efficacy and success. BCAction is very straightforward and does not try to make cancer pretty or comfortable. I like BCAction’s strict corporate funding policy. I like that we are outspoken and unapologetic about critical breast cancer issues. What most excites/inspires you about the work BCAction does? I’m interested in looking at the causes of breast cancer; I’m all for curing diseases but there are so many bigger problems beyond. I’ve always been interested in the health of the world and I want to see more disease prevention. To me that’s the most important thing; as someone who’s been diagnosed with the disease, I want to help stop cancer from developing in the first place. In my view, capitalism is the biggest barrier to making more progress in the breast cancer epidemic. As long as there’s money to be made in healthcare, corporate profits will skew the issues away from our truly benefiting improved health. I’m very into complementary and integrated medicine, and I had success in healing through chemo with alternative and complementary medicines. It was an opportunity to put my own philosophies about healing into action. I felt extremely fortunate to have an overwhelming amount of support and kept myself extremely busy during treatment incorporating a variety of healing modalities. I wish every cancer patient had the financial, emotional, and physical support that I had. That’s the world I’m working for.